Designing your own Home or Extension can be simple if you follow 3 Basic Guiding Principles. People wanting to build often ask, “Where do I start? It’s all so confusing. The more I think about it the more complicated it seems to get.” Sticking to some basic rules avoids the confusion. Rules focus the mind on the order in which things need to be done. The discipline of sticking to basic rules results in a methodical approach which deals with problems in their correct order, as they arise. To distil one’s ideas into a homogenous, resolved single idea is what all designers strive for. Sounds very easy, doesn’t it? But it’s very, difficult to do well. Everything starts with ideas. Research is the first and most important step towards developing your final idea. Magazines, display homes, architecture magazines, what works in your home, what doesn’t work, same with your friends’ homes. Measure room sizes and get used to the idea of standard room sizes. Generally, too big is not necessary, wasteful and inefficient. Learn about Solar access and other important sustainable design techniques. The more time invested at the planning stage the more money and time you save at the building stage. To start thinking about a house design in isolation, without considering the site or its orientation, is the most common, first and most obvious mistake made by most, designers and builders. Why is the client / homeowner not to blame? Because they are not design professionals and rely on professionals to give them the right advice. The block of land and its orientation determine how much space you have, where to orient for solar access, views, street appeal, privacy, useful creation of private open space and satisfying the various building regulations. The average display home design is not going to work and is just an easy solution for the uninterested, uninvolved or inexperienced purchaser. For children, ideally 1 x additional bedroom each. Any extra rooms would fall into the category of a lifestyle decision based on wants not needs. Think carefully about how you live. Homeowners in Australia spend most of their time in an open plan Kitchen, Meals and Living (K/M/L) room. No longer is mum tucked away in the kitchen by herself then serving up meals in a small 4 walled dining room. The open plan K/M/L has developed as a more inclusive and communal family and friends, large, open space for mingling, conversation and cooking. It is the hub, it is where it all happens, so it is the most important area and the first space to be considered by the home designer. It must be large enough, no skimping here, at least 50m2 (5m x 10m). Ideally, it should be north facing and open out to an outdoor entertaining area. Unless someone works from home a full-time study is going to be a room rarely used for that purpose, however, if it can be designed to work as a second living area for parents, teenagers, kids or a bedroom for visitors as well, then it becomes the other key room. Whilst not essential laundries should also try to serve multiple roles to get the most out of a home designs efficiency. So, providing there is enough real estate and budget to include a laundry, placing it near a kitchen and/or a garage so it can also serve as a butler’s pantry and/or washroom, making it more space and budget efficient. The big theme evolving here is to look at designing utility rooms a bit larger than normal so they can serve multiple purposes. A larger laundry incorporating a sewing room or butler’s pantry will feel large and spacious but still be smaller and less cumbersome than 2 separate, single-purpose rooms. Bedrooms should be, first and foremost, separated from the hustle and bustle of the living areas. Preferably on the south side and within easy access to the bathroom. Only 3 sizes to think about here Master 20m2, Double 16m2, Single 12m2. Two-storey homes accommodate bedrooms best in the upper level. All that’s required here is 1 x Bathroom and 1 x Separate toilet. If you only have one bathroom make sure the toilet is separate. With bathrooms typically starting at around $15K each (at this time of writing) you need to consider their cost. Next level up is Water Closet (W.C.) in the Bathroom and a separate W.C. room. Everybody wants an ensuite, to their master bedroom, if the budget allows. Having considered all the owners’ design requirements the plan view of the basic house design is starting to evolve. So why has the look of the house, the outside appearance, also known as the elevations part of the drawings not yet been discussed? The discipline of practical design is to first work out the purpose or client needs, collect them into an efficient plan and then work on the aesthetic appearance. So it’s the client’s needs, in the shape of the floorplan, which initially dictates much of the final appearance of the design. Again, research is the critical step to being able to make informed decisions about the look of the final home design. There is so much information on the internet about architectural periods and design. Anybody can be quite knowledgeable about such things after a relatively short time researching! What style appeals to you? Contemporary, Mid-century, Californian bungalow, Arc Deco, Edwardian, Victorian, Colonial, Beach shack, The Box Stack, whatever it is stick with your chosen style and don’t confuse it with cues from other styles, if you want it to look sharp. Is your design consistent with the period or theme you have chosen? Having said that it is OK and often done, where contemporary extensions are added on to the back of an existing older style, such as a Victorian for example. This can look very effective providing there is a clear visual delineation or difference between the two styles. Round about now is the time to find a professional Home Designer or Designer Builder to help guide you through getting your ideas on paper, in the form of a first draft sketch design. Our next Blog examines this 2nd Guiding Principal. 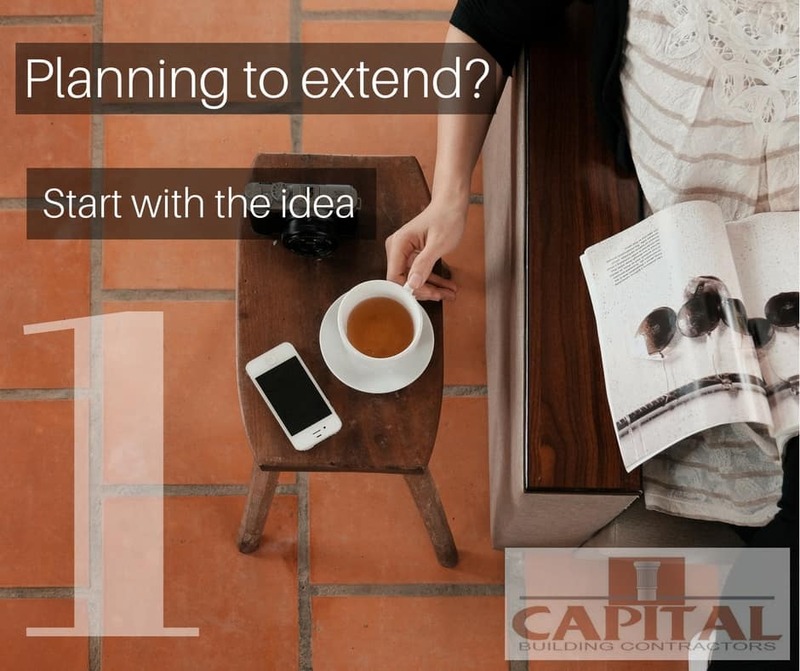 Capital Building Contractors can help you through these stages. Call Peter Harnischmacher on 03 9857 9200 to discuss.